Log in to view all dealer content. Dirt and debris blocks the light on my current landscape lighting system, how are Coastal Source fixtures different? The solution is in our design. These help dispel dirt, water and debris so they cannot compromise your light. My current light fixtures are rusted and corroded shut, I cannot change the bulb. How is the Coastal Source light fixture different? The solution is in the science. Coastal Source light fixtures are made completely of brass. The housing, the nuts, the bolts. Everything. Where other companies fail is using dissimilar metals which rust and corrode with the slightest introduction of water or humidity. Coastal Source products are durable, functional and forever serviceable. Will I see a harsh spotlight with Coastal Source landscape lights? The simple answer is NO. The Coastal Source light fixture is designed as a totally self contained fixture with multiple light settings. This single light fixture is adjustable to allow a tight beam of light to pin point a specific plant or architectural feature. Thanks to built in adjustment capabilities the light can be changed to allow a wider spread of light showcasing and entire garden or seating area. One light, many applications. The Coastal Source lighting system is designed to be used with LEDs (Light Emitting Diode) or standard bulbs. LED bulbs are known for producing a softer light, a glow. By using LED you totally eliminate the possibility of harsh lighting. Patina is the change in an object's surface resulting from natural aging. Patina highlights the modeling of brass and enhances its beauty. Since Coastal Source landscape light fixtures are made of solid brass you can expect your fixtures to naturally patina over time. The Statue of Liberty gets her beautiful green color from the natural patina formed on her copper surface. Why are my new light fixtures changing color? The image below shows how your fixture will gracefully darken over time from a bright gold (left) to a warm amber (right). This will in no way affect the performance or longevity of your fixtures. 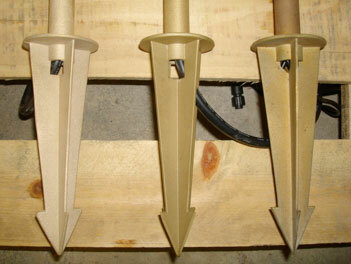 Each fixture is designed to blend in with your landscape over time and will darken with age. An even patina cannot be guaranteed since metals such as brass and copper will react to the oil on your hands as well as the chemicals and fertilizers used in your yard. These oils and chemicals will accelerate the effects of patination and will typically do so in a non-uniform manner. 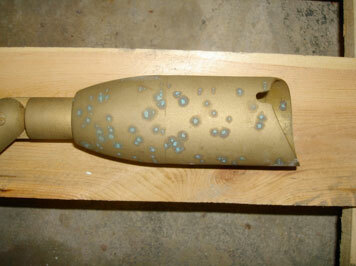 The image below is an example of what can happen if fertilizers are accidently sprayed directly onto a fixture. What can I do about the patina? The best thing to do is let nature take its course. Some companies offer powder-coated fixtures to combat the effects of weathering, but these types of finishes will inevitably fail, thus exposing the cast aluminum and even steel components that will eventually oxidize, rust and fall apart. Many companies offer fixtures with a combination of copper and brass, but dissimilar metals will result in the phenomenon known as galvanic corrosion in which more noble metals attack and corrode less noble ones. Coastal Source solid brass fixtures were designed to weather the elements with little to no maintenance so you can spend more time enjoying your lights rather than replacing them. Why do Coastal Source fixtures come with marine-grade tinned wire? Marine-grade tinned wire, like the wiring you would find on a luxury yacht, is specifically designed to weather moisture, heat and abusive environments – like your yard. These conditions are extremely corrosive. Corrosion is the number one failure in electrical systems. By using patented Coastal Connector and marine-grade tinned wire the Coastal Source landscape lighting system will defy the elements and keep your landscape lighting system shining for years of enjoyment.